Super Bowl Sunday is five days away! 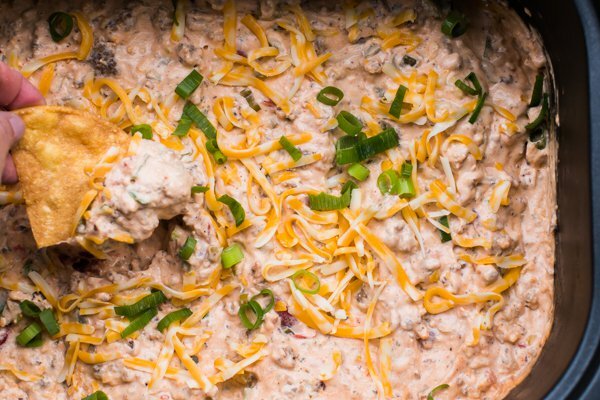 Time to start prepping for that party and this easy dip is guaranteed to be a winner with any crowd. Brown the sausage, drain and place it in the slow cooker. Add cream cheese, salsa, and sour cream. Stir together, the cream cheese will take time to melt. Cover and cook on high for 2 hours or low for 4 hours, stirring occasionally. Once the cooking time is done, stir. You can switch it to warm setting to keep it hot. Sprinkle shredded cheese and green onions on top, if desired.